In the manga Aku no Hana (Flowers of Evil), a lot of the main characters read the book Les Fleurs du Mal by Baudelaire. But what is written in there that affects Takao and Nakamura to the point where they wish to commit suicide so badly? How did the text of that book impact the characters in the series the way it did? First, check out this link. It contains an original poem (Death of lovers) of Death in Les Fleurs du Mal by Baudelaire as well as various interpretations in English. From what I can gather, it seems like achieving death is some sort of bittersweet enlightenment. In the following link, you can scroll down to La mort des artises (Death of artists) where they have an English analysis on the poem. TLDR: Life is pointless, might as well die in order to seek the pleasurable afterlife. It seems like a reoccurring theme in this book is the negativity in life. Thus death is actually something to desire. Life is full of pain to begin with, and if we die anyways, then all the happiness means nothing. Either we enter the afterlife and achieve true happiness, or the afterlife doesn't even exist making our everything in life meaningless. Takao and Nakamura probably became deeply indulged with these themes because they were both persons that have been alone their entire lives. Interestingly, after the failed attempt of suicide, Takao's life appeared meaningless for the longest time (until he met Tokiwa). Tokiwa brought up the book again (Les Fleurs du Mal) and this is what changed Takao's life around. People may interpret differently when reading a book the second time around. I bought an English adaption of Baudelaire's Flowers of Evil, and hopefully I can answer your question. Because they share the same title, I will refer to Baudelaire's work as "The Flowers of Evil" and the anime/manga as "Aku no Hana". Both Baudelaire and Kasuga have an obsession with a female "muse", In Kasuga 's case - Saeki. Baudelaire has several poems with Muse in the title that refer to her grace and perfectness in a world full of woe (for him at least). In many of his other poems, his muse is mentioned through other features of the world - like "the brilliant sun". He idolizes this woman, wanting her to remain untouched by the evil of the world - that she finds her happiness, of course not with himself - he isn't worthy. We see this in Aku no Hana repeatedly, when Kasuga refuses to believe Saeki can be happy with him as her boyfriend, the fact that he steals her gym clothes, when he explicitly calls her his muse. Both Kasuga and Baudelaire experience the world in a despairing light, generally the blame is placed on themselves for not being able to see the wonder in the world. For the majority of the story, Kasuga is coaxed by Nakamura to do perverse deeds - Kasuga generally resists, wanting to be a normal citizen and enjoy his life if he can. As time grows on in Aku No Hana, Kasuga more readily accepts his depravity and falls to Nakamura's ideas quickly, as they slowly become the only excitement that exists in his life. Baudelaire also accepts that he will never enjoy the world as other people do. Baudelaire has a second female figure in several of his poems - perhaps it is a concept of beauty itself or someone particular in his life. This figure is of immense beauty, but revels in despair. In the poem "All Entire", the Devil himself comes to the poet's side to complain about this figure's alluring evil. If Saeki is the muse, this figure is certainly Nakamura in the anime. Kasuga slowly falls into complex feelings for her, knowing she is a bad influence, but clinging to the enjoyment that life provides. The show depicts Nakamura in a constant evil light. The only time we gain an insight into her true self is a glimpse of her diary, where it is written about her joy of finding a pervert equal to herself. 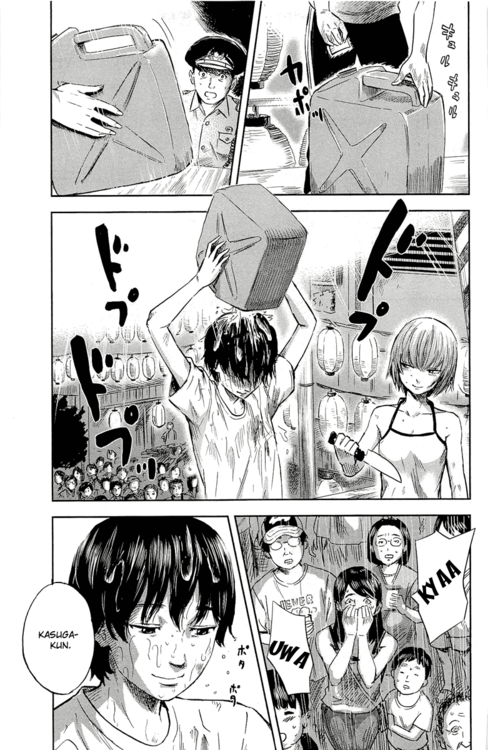 In a way, Aku no Hana is actually about Nakamura's unveiling rather than Kagura's fall into despair. From God or Satan? Angel, Mermaid or Proserpine? The final lines show a little bit of the relief Baudlaire recieves from embracing this Beauty's evil. We see this in Kasuga's actions too when he gradually starts to enjoy the despair and Nakamura's wiles. As a side note, we can see Kasuga's conflict of loyalty to Saeki or Nakamura to be a reflection of his internal conflict to either conform or reject society. Saeki selflessly forgives him repeatedly, willing to accept him. Nakamura, on the other hand is full of angst and rejection. As mentioned in @krikara's answer, there is indeed a few poems mentioning death, Baudelaire seems to alternate these poems between the theme of erotisism of the darkness in death and treating Death as a proof to his meaningless existence - that it is all for naught once you are dead. He also often sees the world through lenses of death, in which he describes beautiful surroundings, but through images of decay, loss and ruin. So? Get to the point already! All of these strong parallels strongly indicate that Kasuga's personality is quite like Baudelaire's, and as of such he was taken by the work. We all know it's easy to get obsessed by things you enjoy (look at all these anime questions I've answered :v) and Kasuga probably became obsessed with the book as a result of this similarity of minds. Add in his situational circumstances - his fascination with Saeki, his seduction into darkness by Nakamura and you can see how a work would be influential on his life. Although, Kagura does mention at one stage (on the mountainside I believe) that he enjoyed reading Baudelaire's works to feel more intelligent than the others in his class, despite not understanding them. So you can make a judgement call on that too. Not the answer you're looking for? Browse other questions tagged aku-no-hana or ask your own question. What is Kasuga reading from in chapter 34?